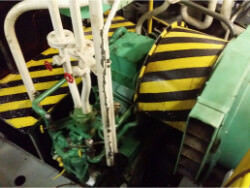 We performed a repair on AMARILLO SS450A. 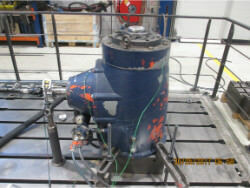 We performed an inspection and overhaul on a gearbox WGW 280-S-50. 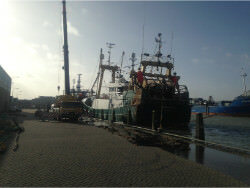 -Complete overhaul of the winches and pulley blocks. -Composing inspection report and advice. -Disassembly of the pulley blocks. 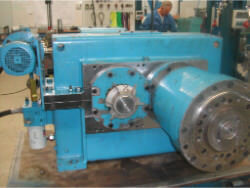 -Manufacture of certified shafts, bearings, couplings, chains and gears (Lloyd's classification). -Applying a two-layer seawater-resistant coating. We performed a repair on AMARILLO HH-350. We performed an inspection and revision on HALBERG RTDB 1000-76x2 106364. 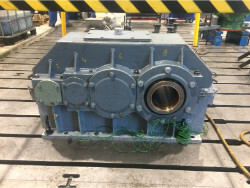 We performed an inspection and revision on FLENDER gearbox G1VY size 670. 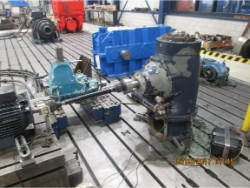 We performed an inspection and revision on gearbox ASUG GVE 800x3,75-800x0,4. 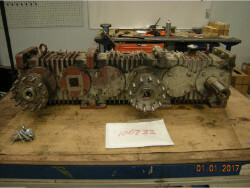 Performing of a visual inspection of the gearbox. 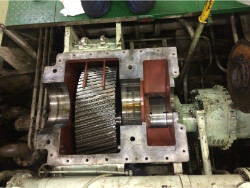 We performed an inspection and revision on gearbox ASUG GDG 1265x8,9. 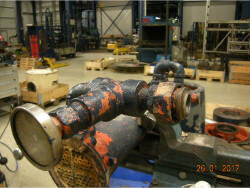 We performed an inspection and repair on a gearbox LOHMANN & STOLTERFOHT GCS850. 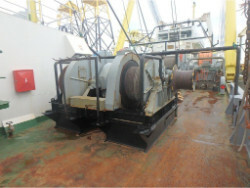 We performed an inspection and revision on FLENDER gearbox G1VY. 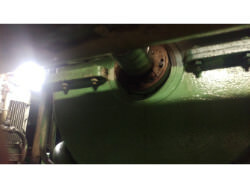 We performed an inspection and repair on a gearbox RENK AWS-315. - All piping and electric connections were removed. 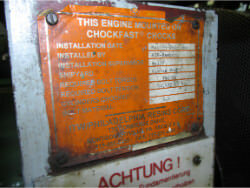 - Hydraulic pump for the rudder control was removed. 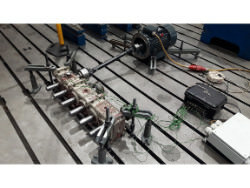 - The input shaft coupling was disconnected from the main engine. 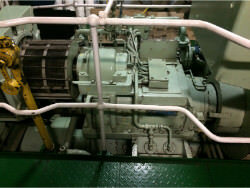 - Performing of a visual inspection of the propulsion gearbox onboard. 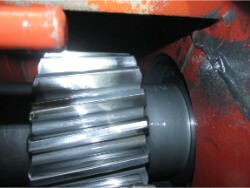 - Performing of a videoscopic inspection to check the gears and the bearings. - Deploying of the inspection report. 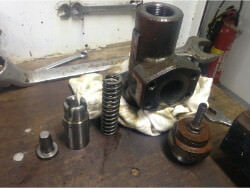 - Disassembling, cleaning and inspection of the gearbox. - Performing of the repair constructions. 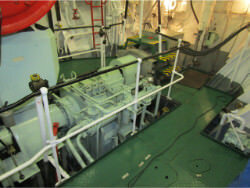 - Performing of a visual inspection of the two propulsion gearboxes onboard. 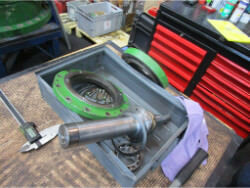 - Performing of a videoscopic inspection to check the bearings of the gearbox. 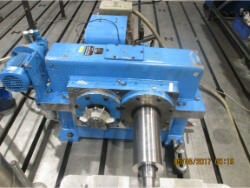 - Performing of a visual inspection of all bearings and gears. - Measurement of the bearings for side clearances. - Inspection of the oil filters. - Performing of a visual inspection. 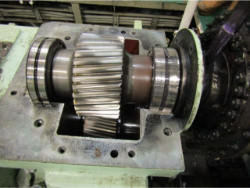 inspection of the gears and bearings of the gearbox, a videoscope was used. - Performing of a visual inspection of all bearings and gears with the aid of an endoscope and a camera. 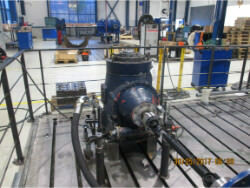 - Measurement of the side clearance on the bearings. 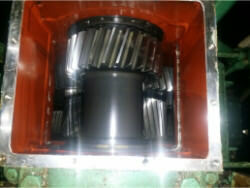 Visual inspection on gearbox Renk hsusl-1020. Inspection on the oil filters. - Disassembling and ispection of the gearbox on location. 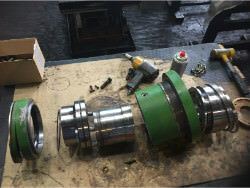 - Renewing of the axial-radial bearings of the input hollow shaft. 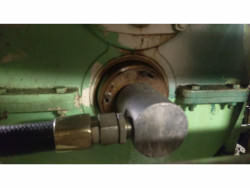 - Refacing bearing surfaces of the hollow shaft. - Performing a visual inspection. - Controlling the first intermediate shaft for micro pitting. - Performing of a videoscopic inspection. - Bringing back of the oil level under the maximum allowed.